Being well into autumn in the Lothians, it is now a great time to ensure you have some of nature’s seasonal supplies in the cupboard. My husband and I have had a very busy month. 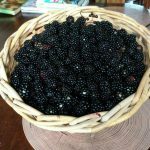 We were out berry picking – and weren’t the brambles huge this year? Brambles (blackberries) grow wild on prickly jaggy climbing or crawling shrubs, Rubus, often found on road verges or uncultivated ground. 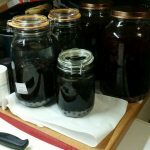 We made bramble jam and, as there has been a glut of apples, we’ve made bramble and apple jelly, too. Although technically speaking, apples are not usually ‘found’, we were given bags of wind fall apples. Both blend themselves into making delicious tarts. Brambles can be eaten raw and complement yoghurt, cream or ice cream, and cordial can always be made from these fruits that are naturally high in Vitamin C – or take it a step further and try making fruity Bramble wine. Last weekend we were out again, this time harvesting sloes. Sloes are bluish black fruits from Prunus spinosa (Blackthorn) a very prickly shrub or small tree usually used as a hedge. Farmers use these trees as a stock defence – their thorns making them impregnable to most if not all animals. We picked a bucketful and returned home, scratched and cut but happy with an important ingredient to make sloe gin. An evening was then spent pricking the berries before washing and soaking with sugar and gin. We leave the mixture for around a year, with mixing and shaking periodically, before consuming. There are other fruits or berries from small trees ripe for picking just now. There has been a bumper crop of crab-apples (Malus fusca) and rowan berries. These are common and widespread, easily picked, washed and made into jellies. Crab-apples make good cider too. Rowan berries grow in clusters and are bright red – although cultivars of Sorbus occur in gardens producing different coloured berries and are not suitable for eating. Elderberries (Sambucus nigra) are also prolific and make excellent wine, sauces and/or jellies. These, too, are common and easily recognised by their clusters of purple, almost black, small fruits. Beware – do not eat or pick unripe berries; only the near black is edible. They can be dried or frozen for later use. Rose-hips are an abundant source of Vitamin C. These fruits are usually red to orange (cultivars range to black hips) and easily collected – barring the thorns of Rosa rugosa. Rosehips can be used to make herbal teas and other beverages, jam, marmalade, jelly, wine, bread and even soup. Recipes can be downloaded or even found the old way, using a good cook book! These can be eaten raw – carefully – to avoid the hairs inside the hip. This month look out for sweet chestnuts from mature trees; good for roasting, or why not find horse chestnuts (conkers) for games with the children – including plant your own tree(s)? Acorns or beech nuts can be similarly planted. Hedgerows in the Lothians are prolific – a great source of ‘free’ food from the wild berries and fruit, but please only pick what you need and close the gates behind you – always leave some for birds and animals. Never eat anything you are unsure about and, nowadays, this can be easily checked on the internet. Another piece of advice is not to pick berries or fruit from plants growing beside roads due to exhaust emissions.